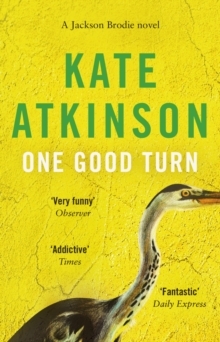 One Good Turn is the second book in Kate Atkinson's Jackson Brodie series, and follows Case Histories. Like Case Histories, One Good Turn is an unconventional crime novel in the sense that Brodie, the detective, doesn't actually do very much in the way of solving crime. In this particular book, he happens to witness a road rage incident which happens to be linked in a complicated fashion to his accidental discovery of a drowned woman's body. All this takes place in Edinburgh, which he is only visiting at all because his girlfriend is appearing in a terrible play as part of the Edinburgh Fringe. Coincidence, mistaken identity, being in the wrong place at the right time - these are often central to Kate Atkinson's work and this is no exception. There are recurring references in it to a set of Russian dolls, which are not only a clue to a character's past but also a metaphor for the manner in which every time a mystery is solved in this book, it simply reveals another one as links between previously unconnected characters start to become clear. One Good Turn is a very, very British novel, not so much because of the misunderstandings on which the plot hinges but because they become significant primarily because people are too polite or embarrassed to correct them. One character, cosy crime writer Martin Canning, panics and throws a briefcase at someone he believes is going to kill another man in the same road rage incident witnessed by Brodie. Simply because he can't quite find the right time to correct the paramedics when they assume he knows the victim, he becomes embroiled in a traumatic sequence of events in which a number of people die. Like all Atkinson's books, One Good Turn is full of flawed characters trapped in situations and relationships from which they can't, or won't, escape. Everyone is dissatisfied with their lot, whether it's Brodie himself struggling with boredom in his early semi-retirement, Gloria Hatter counting the days until her wealthy conman husband dies, or lonely, gentle Martin Canning, who longs for a family life so unattainable that in his head, it's set in the 1940s. I know some other readers find this element of Atkinson's books somewhat depressing, and I can understand that, but it's also the source of a great deal of dark, observant humour (I found it laugh-out-loud funny in a couple of places) and a matter-of-fact honesty about relationships that's almost startling at times. I enjoyed One Good Turn a great deal. I didn't like it quite as much as Case Histories, simply because I found the mystery at its heart a little less engaging, but it's still a great read. I'll definitely be continuing with the series.